Benefits for veterans who require assistance with daily activities are available to those who meet the basic requirements for aid and attendance benefits. Aid and attendance benefits are added to a monthly veteran’s pension amount, and cannot be applied for or received separately from the pension. A qualifying veteran can use the aid and attendance benefits to hire a non-family member to meet his level of need with daily activities, or can use the funds to compensate a family member for providing the same assistance. If a veteran’s spouse is the one who requires the additional assistance, and the veteran is not in a position to provide the needed help, he may have questions as to what extent he can use his aid and assistance to hire a caregiver for his spouse. Generally speaking, only surviving spouses of eligible veterans are eligible for aid and attendance benefits if they are receiving a survivor’s pension, also known as a death pension, after the death of a veteran, and meet the medical criteria. 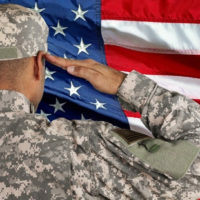 However, in some cases, veterans who have a 30 percent or more disability rating, may be able to receive additional monthly benefits for a spouse who is sick or disabled and in need of the assistance of another person in performing daily activities. Spouses of veterans are not required to meet a disability rating for added benefits, but they do have to prove a regular medical need for the assistance with daily tasks. These additional benefits can be applied to hire in home caregivers or to offset nursing home costs, however, costs related to an independent living facility are less likely to qualify because it implies the person seeking the benefit does not need help with daily tasks such as bathing, dressing, or preparing meals. Surviving spouses are limited in how much they can receive in disability assistance from the VA on the same veteran spouse. For example, if the surviving spouse is receiving a survivor’s pension he or she cannot also simultaneously receive payments under Dependents Indemnity Compensation or DIC. Income from VA sources can also affect a spouse’s eligibility for other government programs such as Supplemental Security Income (SSI) or Social Security Disability Insurance (SSDI) that base eligibility on disability and income. Veterans and their spouses should remember that there are income and asset limits for the VA allowances and benefits like aid and assistance, although the asset limits exclude the value of the couple’s primary residence and vehicles. Before making any decisions on reducing income in order to qualify for VA and other government benefits, veterans and their spouses should consult an experienced attorney for more information on how this would affect their overall estate plan. If you are a veteran or a surviving spouse, you may be eligible for aid and assistance benefits that can help you get the assistance you or your spouse need for your daily living. To get started on your application and get further information on the program and benefits, contact an attorney at the Millhorn Elder Law Planning Group located in The Villages, Florida today.